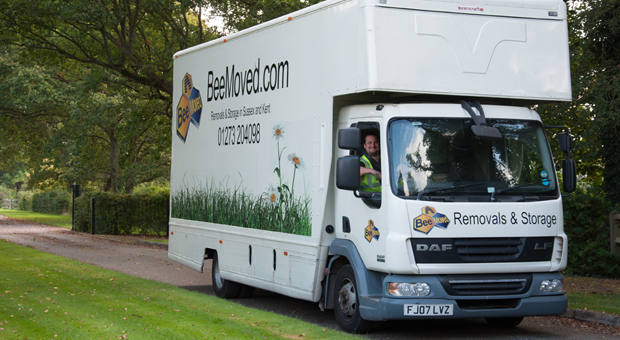 Bee Moved is one of the most experienced removals firms in Brighton & Hove also serving Worthing, Crawley and Tunbridge Wells. We were established in 2001 and are focused on offering professional moving solutions to over 600 residential and commercial clients each year. We employ trained and skilled staff to pack and/or deliver your household items to the right destination and rooms on time. Ask us for a free quote and compare our great prices and unbeatable services. We won't ask for any deposits, which mean that you can pay once the relocation is completed and you are satisfied with our services. For a more tailored idea for your requirements speak to our Brighton office on 01273 204098 or fill out our free home quote service and we'll have a price back to you within 24 hours. Equally for quotes in Worthing please contact us on 01903 204098, for our Tunbridge Wells office please call 01892 616222, for our Crawley Ofiice please ring 01293 22 20 98 and for our Eastbourne office please contact us on 01323 401099. All our offices are manned Monday - Friday 8am - 5pm and our Brighton office is open on Saturday between 9am - 12pm. Brighton is home of our head office and where our storage centre is based but we also provide services in Hove, Worthing, Crawley, Eastbourne and Tunbridge Wells. We can come to your house for a free quotation on moving home to home. We also provide packing boxes and packing services so you don't have to worry about lifting a finger. If you would prefer to do this yourself we can arrange for packing boxes to be dropped off to your house free of charge. With packing whether you do it or we do we will provide you with bubble wrap, paper, tape and boxes. Since you need to make plenty of decisions while moving, we aim to simplify your entire moving experience. From phoning into us at the office and booking your free no obligation quote, to receiving your quote within 48 hours, then on acceptance of our quote, receiving your packaging and then the removals day itself we guarantee to make this as stress free as possible. We guarantee a manned office Monday-Friday 8am-5pm and Saturdays 9am-12pm. Ask any other firm if you can provisionally book in a date with them. We guarantee to hold that slot for you upto 7 days before the move at which point you will receive a courtesy call from our office to see if that date is now confirmed. We guarantee to offer the very best service to each client. With no deposits and no upfront payments, this sets us apart from all our competitors. Just ask us for a FREE quote to see how helpful we are. Quotes if required are inclusive of packing materials and delivered to you as and when before your move date, these are included at cost into your move price offering further value from Bee Moved. With over 13 years of professional experience, our dedicated moving staff can help you out with all small and large residential as well as commercial removals. Since safety of your belongings is our prime focus, we adopt a very stringent process in picking the right individuals who can deliver your belongings carefully and safely to the right location. All our customers are involved in the process with the help of our supervisors on the day ensuring your are introduced to the staff, the property is empty on loading and the vehicle is then empty on delivery and signed to by yourselves. At Bee Moved, customer satisfaction is our prime motive and hence we train our staff accordingly in manual handling and loading to ensure that your valuables reach its destination damage free and safely. Our professional removal services are flexible in nature which can be adjusted to suit your specific relocation needs. Just reach us online and share your exact moving requirements and we'll send you a FREE quote in return or contact us on 01273 204098 and arrange a free quote visit. To further simplify things, you can use the Beemoved Removals Move Minder on this site and start planning the day of your relocation. You can use this to save your contact details and other personal information. Use your laptop, desktop computer, ipad or other handheld device; you can complete the entire registration while on the move. Before starting to pack your property have a good sort out of what you actually want too take to the next property. Then figure out which items you want to keep for yourself and which ones you wish to donate or just to your friends or family or charity. When packing ensure all items are packed securely. With the packaging we supply there are two types of boxes, one smaller than the other, but both double walled strength. Ensure when folded out both types of boxes have at least 2 strips of tape, north to south and east to west accross the bottoms to make good strength. With the smaller box you can fill these right up with books or records and they won't be too heavy for us to lift. Equally these smaller boxes can be used in the kitchen for crockery packing. Please ensure crockery and glassware is wrapped in the packing paper provided and padded out with either additional paper or tea towels or soft items from the linen cupboard. For really fragile items please use the bubble wrap provided aswell as paper. With the large boxes these are still good for packing crockery and glassware but only half way with the rest of the box being filled with pillows or lighter items. With the larger boxes these are then great for packing away any other items in the house, toys, shoes, foods, etc. Remember on the day of the move we provide wardrobe boxes which number wise would have been appropriated to your move at point of survey in order to keep your hanging clothes clean and tidy. We can also assist you with packing your items with care. Just click on Packing Services to see our prices. So while we pack your belongings, you can conveniently plan a stress free relocation and saving you a lot of time. Packing is typically performed the day before the removal day. We take extra care in protecting your possessions from all damages with blankets, ties ,covers, sofa and mattress bags. In addition to our complementary goods in transit insurance, we also provide additional liability removals insurance. This type of insurance can insure your goods to their full value up to £30,000 per load. To find out more about our full policy details, check out our removals insurance page. By paying £60 per hour for 2 men and a luton van inclusive of VAT and fuel, you can use our small removals service. Pay for a minimum of two hours and after paying for the first two hours, you can then pay on a half hourly basis. This service is essentially known as Wee Bee Moved. Our services are backed by trained staff, ties, sofa covers, blankets, wardrobe boxes and mattress covers. You can also call us on 01273 204098 to ask for a FREE quote and get tailored made solutions. We'll get back to you within 24 hours or you can fill our online request form for small removals. Appoint Bee Moved removals as soon as you like the quote price and pencil in your tentative removal date you are working towards. We will hold this date and slot up until 7 days before your move at which point you should know if you are moving but equally we will call you from the office 7 days before to see if your removal is going ahead, its all part of the service. Ensure you have the correct moving insurance in place. Prepare your FREE online removals checklist with the aid of our Move Minder. Type and quantity of furniture you want to move. Accordingly, Bee Moved can then allocate the right size truck/s for your relocation and plan the journeys required to deliver all your valuables to the new location. Tentative idea about the number of boxes which are to be packed to estimate the total duration of time in completing the given task. The exact time when the moving team should come to your home/office. Arranging proper parking space for the removal van. Pre inform Bee Moved about bulky and large size furniture pieces which you think cannot be taken out through the door. Think ahead to where the Bee Moved team should put each of your belongings at the new property.